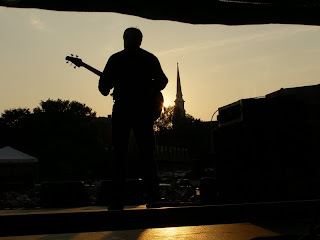 The Lowell Folk Festival is going on this weekend. The National Folk Festival was in Butte, Montana two weeks ago. I wish I could've attended both, but I can't be in two places at once. I had a great time at the North Atlantic Blues Festival two weeks ago, so I can't complain too much about missing the festival in Butte. This weekend I am working instead of attending Lowell. I could probably complain about that, but I won't. There is less than a month, now, until our festival in Bangor kicks off once again. Gotta like having a free festival I can walk down the street to attend! For information on this year's festival go to the American Folk Festival web site. The image above is from the opening set by the Bruce Daigrepont Cajun Band (from New Orleans) on the Heritage Stage at the 2007 American Folk Festival on the Bangor Waterfront. Submitted to Shutterday's Anything, Anything, Anything Under The Sun challenge.